The $50 Amazon Fire Tablet is likely the most successful device that Amazon has ever released. The company has claimed to have sold millions of them from the time it launched a few months ago to when it was discounted to $39 on the Black Friday holiday weekend. Many people have bought this tablet to check emails, watch videos or surf the web. It certainly will not win any awards for the specs, but is cheap and cheerful. Is it a viable investment and should you buy one? The new seven inch entry level Amazon Fire Tablet has a resolution of 1024 x 600 pixels. This is a bit of a downgrade from last years six inch model, which had a resolution of 1280 x 800. Underneath the hood on the upcoming 2015 six inch tablet is a quad-core ARM cortex-A7 processor with Mali-450 graphics, 1GB of RAM, 8GB of storage. You will be able to snap pictures with the rear facing 2MP camera or access on-demand video chat via the 0.3MP front camera. One of the big selling points is that this model has an SD Card. 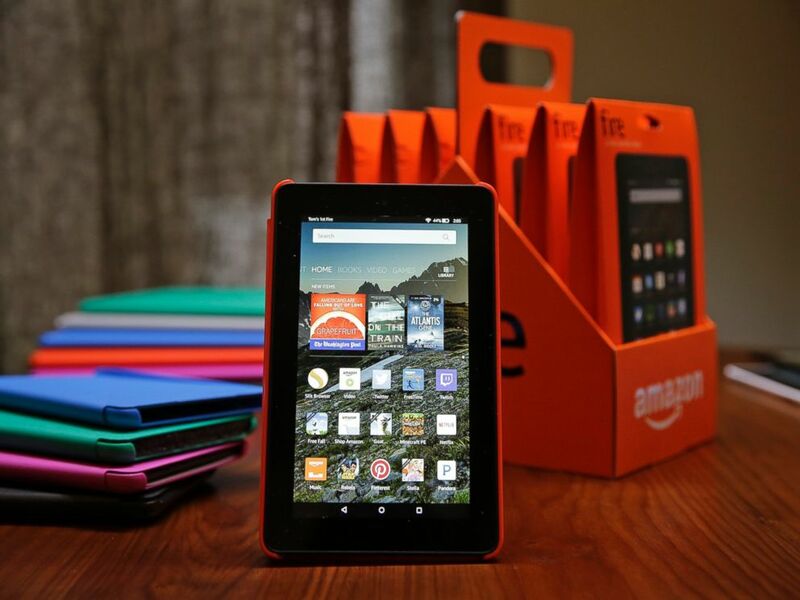 It is the first tablet by Amazon ever to have one, which is fairly compelling. SD memory has really come down in price the last few years and you can buy a 128 GB model for a fairly reasonable price. The SD is meant to store all of your videos and music, but keep in mind it will not read e-books directly from the SD. Overall, the tablet is made of plastic and not aluminium like most other devices on the market. This makes it feel rather cheap and it dents really easy if you should drop it. Amazon is trying something very different with this $50 Fire tablet. They want to offer the most affordable way for people to participate in the Amazon ecosystem to buy audiobooks, e-books, magazines, newspapers and apps. This has always been the companies MO, sell the hardware at a near loss and make it up by selling people stuff. It has never been more evident than with this particular tablet. The $50 Fire is one of the first tablets to feature the new Amazon OS called “Bellini.” It introduces an updated user interface that provides the best entertainment experience on a tablet, making it easy to access your favorite apps or discover new content. The new home screen includes dedicated content pages for books, games and apps, video, music, audiobooks, and periodicals—each page presents an engaging layout akin to the beautiful pages of a magazine and presents your recent content as well as personalized suggestions for new entertainment. If you subscribe to services like Prime, Kindle Unlimited, or Audible, you can easily discover new content that you can access at no additional cost. The updated UI is likely my favorite aspect of this tablet. If you click on e-books, there is a little shopping cart and it takes you directly to the Kindle store, the same thing applies to apps, audiobooks and digital newspapers. In the past, all Fir tablets shared a common shopping button, which wasn’t very initiative. I think Amazon now recognizes that it is unlikely that their average customer buys everything from them, so if you just use your Fire to listen to music and buy e-books, you only need to visit those two independence storefronts. Amazon pioneered the concept of pre-buffering webpages in advance with their Silk browser. It basically recognizes the sites you visit on a daily basis so pages take less time to load. Amazon applied the same technology to their Prime Instant Video platform. It is called “On Deck” and it automatically keeps your Fire tablet current with popular Prime movies and TV shows, as well as Amazon Original Series, so you always have something good to watch. 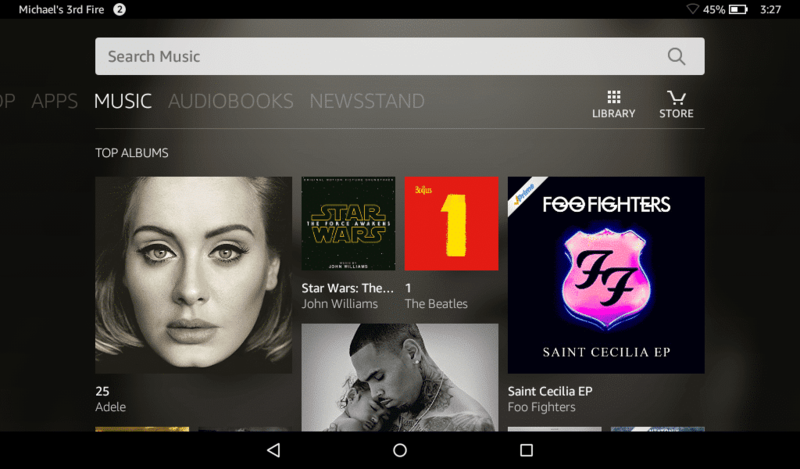 Importantly, On Deck only uses the available storage on your tablet, opportunistically in a special shadow mode. When you download something, On Deck automatically makes room for your selected content—there’s no hassle of needing to clear out space yourself. Basically On Deck knows what shows you are watching, and if you start to binge watch a few television series, it will download the next few so you don’t have to wait for everything to buffer. “Studies have shown that evening exposure to blue light from tablets may suppress our bodies’ production of melatonin,” Amazon said in its press release, “which can prolong the time it takes to fall asleep, delay REM sleep, and reduce the level of alertness the next morning.” Blue Shade is supposed to fix that issue. In reality, Blue Shade is a gimmick. As you can see from our video review below, it is impossible to read e-books or magazines with this mode active. You basically get the equivalent of trying to read a tablet in direct sunlight, it is nearly impossible. I think Amazon needs to go back to the drawing board on this, or simply bundle those special screen protectors that stop blue light from emitting. 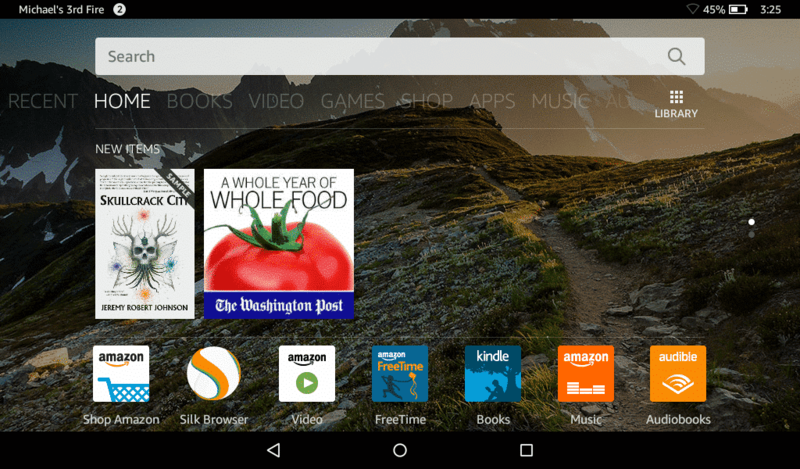 You will primarily read e-books from the Amazon Kindle App for Android. This is the same type of experience as you would get by installing this app on any other tablet on the market. This app provides a number of options, such as changing the line spacing, font size and font type. I guess the only noteworthy thing is the Bookerly Font, which is a brand new font Amazon has developed for e-reading in mind. Bookerly has replaced Caecilia as the new default font for the Kindle Fire line of tablets and their fleet of apps. Bookerly is a serif style of font that has been custom-made by Amazon to be as readable across as many different types of screens as possible. Like Google’s Literata, Bookerly is meant to address many of the aesthetic issues surrounding e-book fonts. 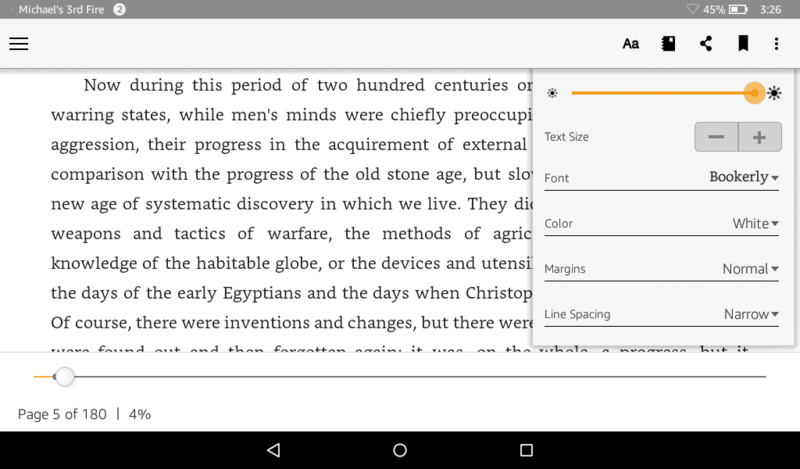 Does Bookerly make a big difference while reading an e-book? According to Amazon’s internal tests, that means it’s about 2% easier on the eye. That may seem like a small improvement, but spread that 2% across millions of Kindle users and billions of pages of e-reading, and it all starts to add up. I think e-reading on this tablet is fine, because of a number of cool features that the competition does not have. The First is X-Ray, which gives you a list of all of the major characters, places and things that are references in any given book. You can also buy the audiobook and have the text highlighted as it plays, while the e-book is open. I think e-reading on this tablet is fine, but if you increase the size of the font too much, it starts to look pixelated. This is primarily due to the poor resolution of the screen. It is hard to go wrong with a tablet that costs $50. I remember a few years ago when tablets were this cheap, they often self-destructed within a few months. Amazon released a tablet that is so cheap, that you would have a hard time passing on it. It is your personal gateway to all things Amazon. This tablet would be perfect for students on a budget, people who have never had one before or someone looking for a throwaway device to add to their collection. Michael, I may have missed it since I use the Paperwhite. My son showed me how much easier on the eyes the Google reader in night view is. Much better than the Kindle application. With my OMLED device it seems to be a great way to read. I do have > 400 ppi though.